Professional musician Tyler Westcott (pictured above) performs at Cricket’s Coffee Co. in the Village of Geneseo. Westcott’s musical talent extends to singing, playing banjo and guitar (Udeshi Seneviratne/PHoto Editor). To the delight of patrons at Cricket’s Coffee Company on Thursday Sept. 6, the soothing sounds of Tyler Westcott’s mixed musical genres reverberated around the shop, livening the ambiance and touching the soul. Westcott played for two hours in a show comprised of both original pieces and covers of popular songs. Describing himself as a proponent of “banjo jazz,” Westcott performed songs from genres including blues, jazz and country. 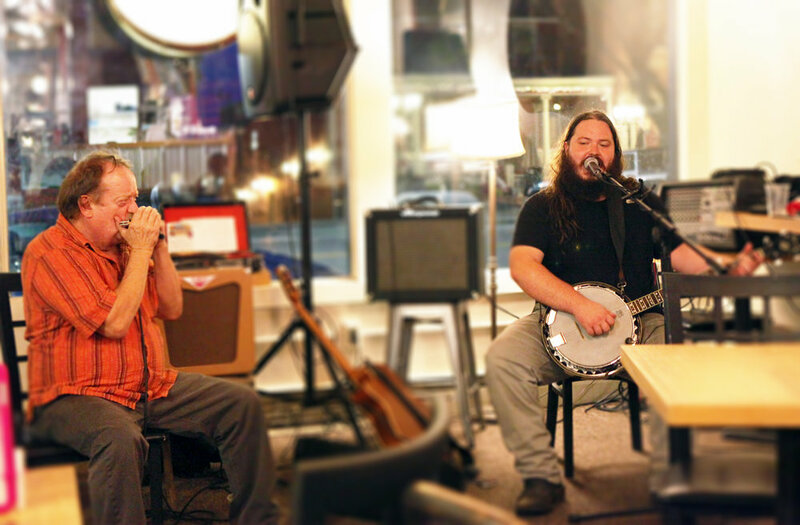 In addition to singing, Westcott played both the guitar and banjo during his performance, accompanied by Geneseo local Tim Beusy’s on the harmonica. Throughout the performance, Westcott discussed the meaning of many of the songs he performed. “[Some songs have the ability to prompt the audience to] choose hope, tolerance and love instead of hate and fear,” Westcott said. The performance included plenty of jokes and playful interactions with the audience between songs, thanks to Westcott’s natural charm and sense of humor. Westcott often asked audience members about their experiences in music. This included asking for recommendations from an audience member on what new kind of banjo he should play next. Westcott has performed with and founded several bands including the Banjo Juice Jazz Band, The Observers and Folkfaces. While he started his music career in Buffalo, Westcott has played concerts around the country. Despite his success across the country, Cricket’s is still one of Westcott’s favorite venues to perform at, labeling it as a “homecoming.” Westcott grew up in Livingston County about 30 minutes from Geneseo. Lecturer of music James Kimball recalled Westcott as a student. Westcott talked to members of the audience he’s known for years, catching up and starting conversations as if no time had passed. Many Geneseo locals have watched Westcott perform over the years. Toward the end of the performance, members of the Geneseo String Band joined Westcott onstage for a jam session. The performance included faculty, students and even locals from the community. Biology and theater double major senior Leeann Bruetsch was among the students who joined in the performance. “It was dynamic, foot tapping fun,” Bruetsch said. Westcott’s performance demonstrated his incredible devotion to his craft. For anyone who missed his performance, Westcott will be holding his second annual Livestock Music Festival from Oct. 11 to Oct. 14 at the Cherry Hill Campground at Darien Center, N.Y. Anyone planning on staying in Geneseo, however, can certainly expect another hometown Westcott performance either at Cricket’s or in Rochester within the coming months, as he can’t resist those feel-good “homecoming” performances.